On February 20, 2018, GetSmarter welcomed 60 guests into their Observatory campus, under the banner of an event celebrating Women in Leadership. This special event – one in a series of exclusive networking and lecture series hosted by GetSmarter – featured guest speakers and a panel discussion, around the theme of helping women to develop a leadership identity. Read more about the Women in Leadership networking event. Are you ready to develop your leadership identity? Register now for the Women in Leadership course. Natalie Williams: The agenda for this evening is packed with incredible, incredible women. So tonight we’re going to sort of hone in on one area of women in leadership and that’s developing your leadership identity. 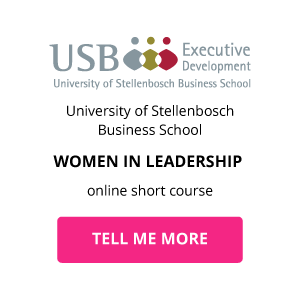 We’ve taken this theme from our Women in Leadership course, presented in collaboration with the University of Stellenbosch Business School and it’s really just the start of a conversation. Thelmé Janse Van Rensburg: I have very specific goals and ambitions, and if I don’t take control of those goals and ambitions then I don’t have any certainty of what I will achieve. Holly Meadows: So I was appointed Editor at Cosmopolitan last year in July. I suppose my advice to you would be to be bold, be a rebel, be brave and follow what you know inside is right to do. Marissa Brendel: My name is Marissa Brendel, yes I am originally from Germany. I’m a Business Coach for women specifically, also a Serial Entrepreneur and a Speaker in terms of entrepreneurship and leadership. Babita Mathur-Helm: My name is Babita Mathur-Helm, and I’m a Lecturer at Stellenbosch Business School. You also have a voice inside you, and if you keep listening to others, you’ll never listen to your own voice inside, but that’s the rebel in me. Marissa: Someone taught me one time, if not now, then when? And actually that I apply nowadays to every single part of my life. So, if I don’t eat cake now, then when?